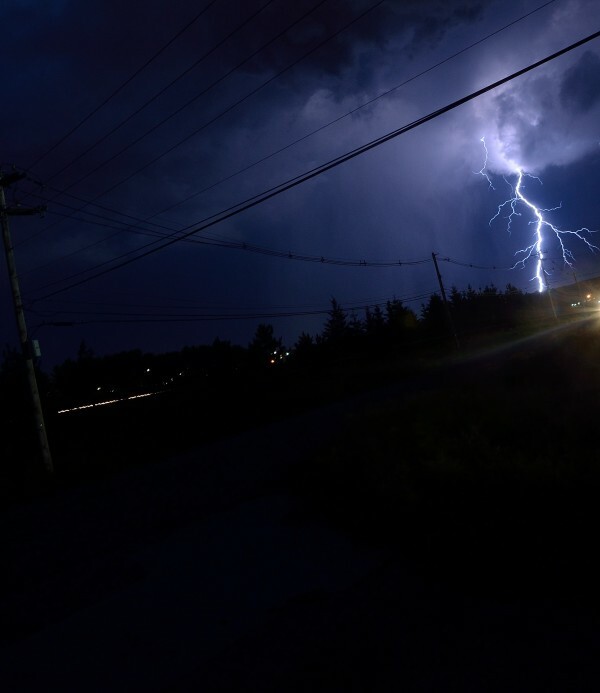 Lightning strikes in Bangor in July 2013. BANGOR, Maine — The entire state is under a hazardous weather outlook, effective Wednesday afternoon into early evening, according to the National Weather Service’s offices in Caribou and Gray. The weather service is predicting thunderstorms that potentially could become severe, with damaging winds and heavy downpours. Some large hail also is possible. “Deadly cloud-to-ground lightning will accompany the thunderstorms,” the service’s Caribou office warned. The thunderstorms are expect to form along a cold front as it moves through northern New England on Wednesday. Given Wednesday’s weather forecast, Emera Maine said Tuesday that it is keeping an eye to the sky and lining up resources to ensure power is restored quickly in the wake of any outages. Over the last two weeks, the utility has been watching lines both from the ground and via helicopter as cleanup from Hurricane Arthur has continued. Additional tree trimming also has been done to help strengthen the system. If outages occur as a result of Wednesday’s predicted storms and winds, Emera Maine urges customers to call the customer service center at 1-855-363-7211 or report them on line at www.emeramaine.com or on the mobile site. — Keep battery-operated flashlights and radios on hand, along with supplies of fresh water. — Make sure smartphones, tablets and other mobile devices are fully charged. — Gas up all backup power sources such as generators. Emera Maine also says generators, grills and camp stove should never be run indoors and that those who do lose power should keep refrigerators and freezers closed a much as possible to retain the cold.